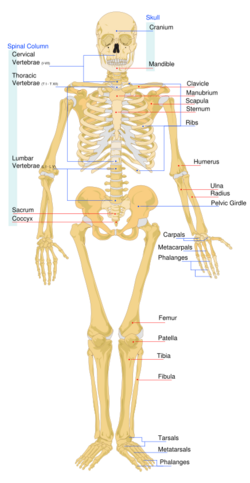 The skeletal system is the biological system that provides support and protection for animals. There are two main types of skeletal systems. The endoskeleton is an interal support system of the type possessed by humans and other vertebrates, which is made of bone. The exoskeleton is an external system that was designed for many invertebrates such as the crustaceans and insects. The composition of exoskeletons vary widely, but known constituents include calcium salts, protein, carbohydrates (chitin) and silicate. It provides support for the overall body. It offers a place for muscle and tendons to attach. It provides a great amount of protection for the vital organs inside of the creature. It adds leverage for increased range of motion. Bones continuously produce blood cells and store calcium. In vertebrates, the endoskeleton is sturdy internal frame that is centered on a prominent spine (vertebral column). Most skeletal systems consists of bones, cartilage, ligaments and tendons and accounts for a significant portion of the body weight (about 20 percent in humans). The living bones use oxygen and give off waste products in metabolism. They contain active tissues that consume nutrients, require a blood supply and change shape or remodel in response to variations in mechanical stress. Bones can be grouped in two divisions: axial skeleton and appendicular skeleton. The axial skeleton forms the vertical axis of the body. They include the bones of the head, vertebral column, ribs and breastbone or sternum. The appendicular skeleton includes the free appendages and their attachments to the axial skeleton. The free appendages are the upper and lower extremities, or limbs, and their attachments which are called girdles. Bone is made of different types tissues including the outer layer of the bone, the compact middle layer, and the spongy third layer. Periosteum The periosteum is hard and smooth. It provides protection to the rest of the layers of the bone. It is almost like the "skin" of the bones. The periosteum provides a site for the attachment of muscles, and also contains nerves, blood vessels, and lymphatic vessels. Compact The compact bone is extremely dense and surrounds the spongy bone. The compact bone also contains many Haversian canals, which also contain nerves and blood vessels. This layer of bone gives the skeleton its strength and allows it to support your bodies mass. Spongy The spongy bone is where all of the blood cells are created from the bone marrow. 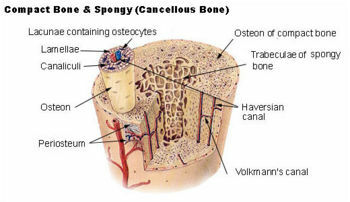 Spongy bone contains two different types of bone marrow: red and yellow marrow. The red bone marrow produces red and white blood cells and platelets. The yellow bone marrow, however, is used to store fats. Cartilage is a tough, elastic, and flexible connective tissue. The ground substance of cartilage is composed primarily of chondroitin. Its extracellular material is produced by chondrocytes, or mature cartilage cells. These cells are too large to directly inhabit the matrix. Instead, they reside in hollow spaces in the ground substance called lacuna. Another unusual characteristic of cartilage in comparison to other connective tissues is it is avascular, meaning that it lacks blood vessels. This is an issue because the chondrocytes are still living cells and require oxygen and other nutrients to function. Therefore, the elements necessary for the cells' survival must diffuse through the matrix. For this reason, the extracellular matrix cannot be very thick. Regardless, cartilage is very strong and durable to withstand arduous circumstances. There are four different primary joints located throughout the body. These are the hinge, the ball and socket, the picot, and the glide joints. The each serve different purposes, and are located in areas best suited for those purposes. The hinge joint is basically a hinge. It can move up and down or from side to side, but within a 180o range. The pivot joint allows for the most movement out of all of the joints. The most common example of this joint is the neck, which can look from side to side, up and down, and almost any way at all. The glide joint is similar to the ball and socket joint in terms of the range of movement, but there is no actual ball and socket. An excellent example of this is a person's wrist, which has extreme mobility. ↑ Cartilage by Dr. Harry K. Wong, The Department of Biodiversity & Conservation Biology, The University of the Western Cape. This page was last modified on 11 December 2014, at 14:33.